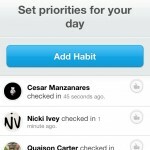 Can Social Networking Give Your Habit Tracking A Lift? 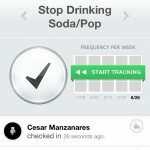 Lift™ (Free) by Lift Worldwide is habit-tracking with a social spin. If there are two facts of life, it's that bad habits can be incredibly difficult to break, and good habits are hard to form. 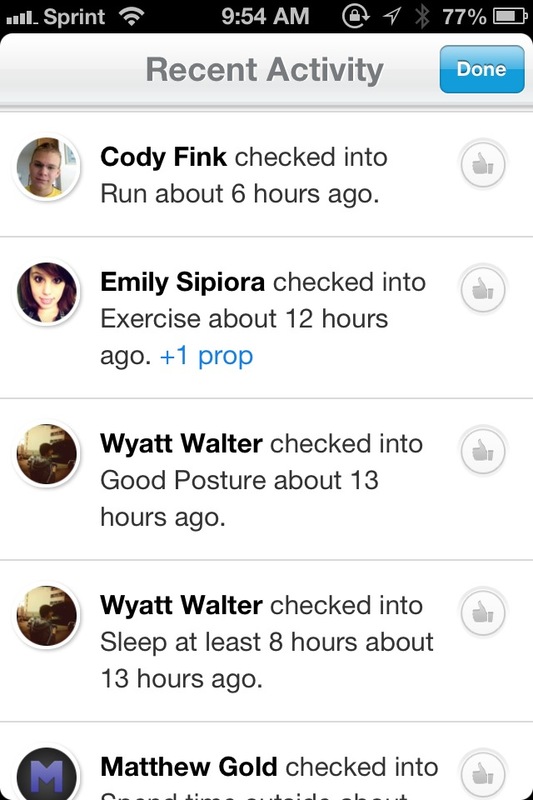 But the developers of Lift want to change that, with some help from your friends (and even strangers). 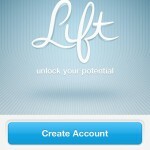 In order to use Lift, you will need to have an account. Fortunately, signup is easy, requiring only your name, email address, username, and a password. 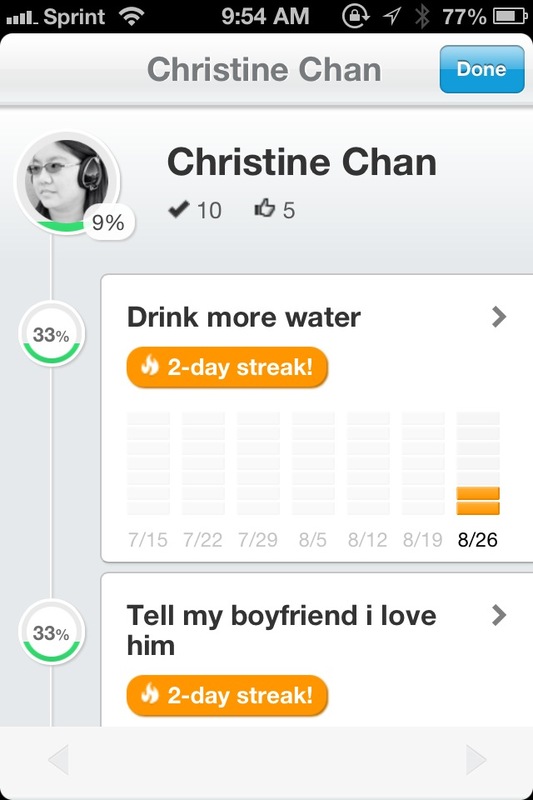 You can even link your Facebook and Twitter profiles to find friends who are already using Lift, and share your habits with them. 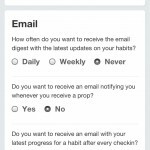 Once you have your account set up, you will want to start adding some habits that you want to keep track of. Fortunately, Lift makes this process extremely easy. 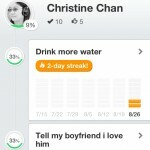 The app will give you a list of the most popular habits (based on how many have pledged), and a lot of these will probably be what you are looking for anyway. Practices like “Drink more water,” “Sleep by midnight,” “Exercise,” and “Inbox Zero” are on the list, but there’s way more to find as well. 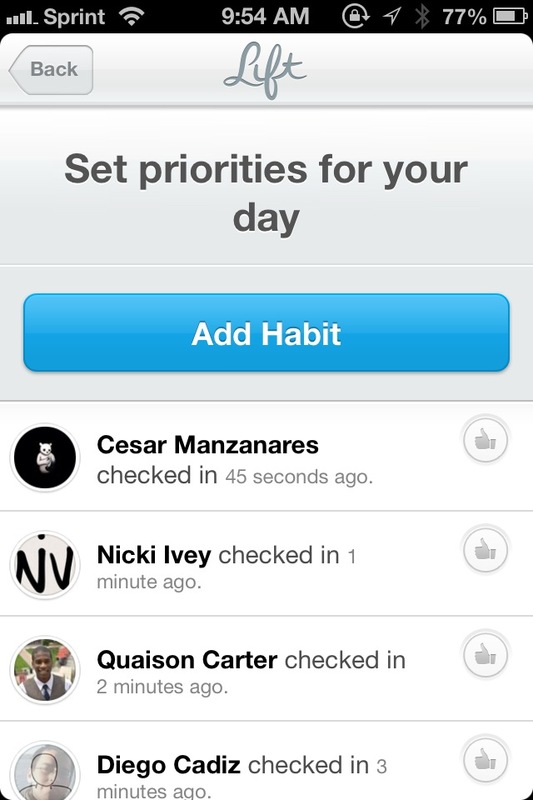 If any of them pique your interest, just tap to view who joined or has checked-in, and then add the habit to your own directory. If you are looking for something specific that isn’t showing up in the most popular list, you can also search by keyword. What if what you want doesn’t exist yet? 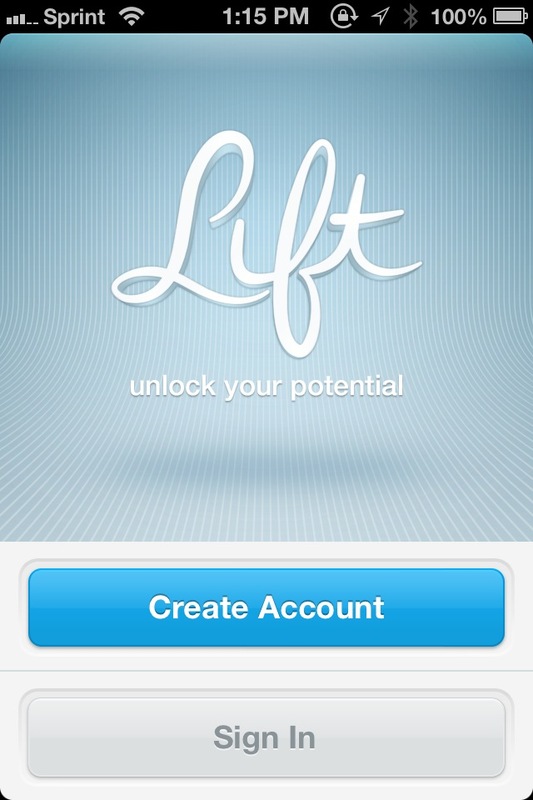 Lift will generate it for you automatically, so all you have to do is join it. When you have all of the habits you want, just tap “Done” to return to the main screen. You will see a list of all of your new customs, but you can always add more with the “+” button at the top. 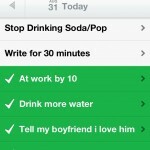 If you completed one of them, select it and tap on the large checkmark to check-in to it. 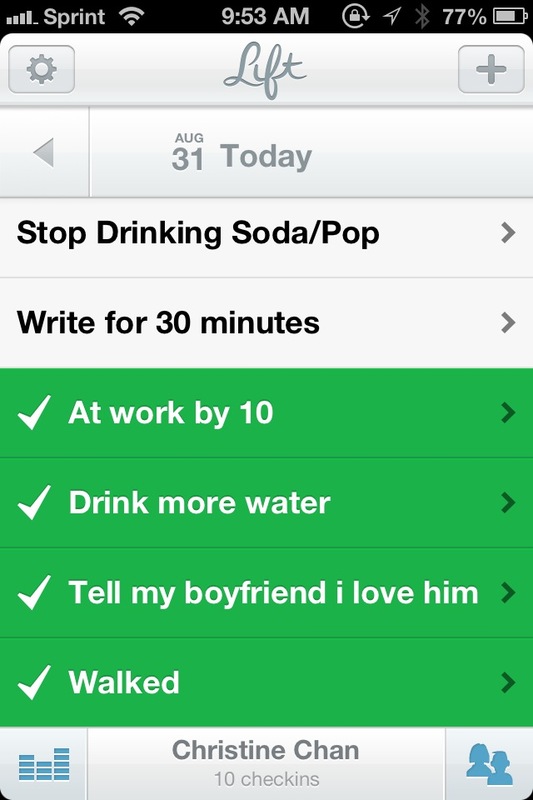 Any habits that you have checked-in to will turn green and move to the bottom on your habit list, so you can see what you have or haven’t done for the day. 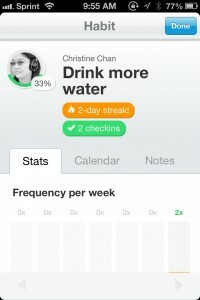 So what makes this app different from others, besides the social aspect? 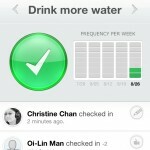 Lift features graphs that show you exactly how often you have been keeping up with your habits. 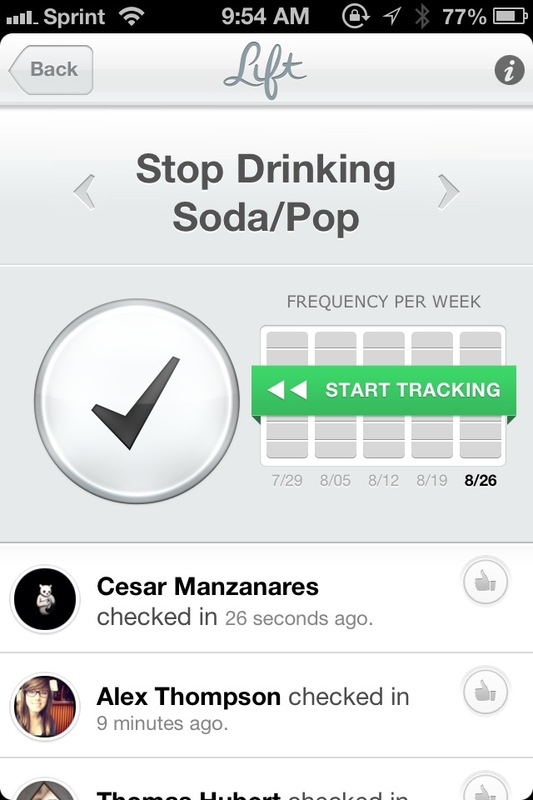 You are able to see how many times you have checked-in, as well as the frequency per week or month. 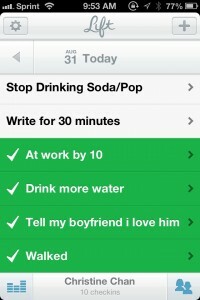 If it’s a broad habit like “Help a stranger,” you can use the notes feature to describe the action. 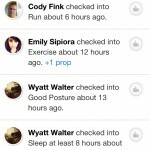 There is a Recent Activity section in Lift that allows you to view what habits your friends from Twitter or Facebook are accomplishing. Even though there is social networking in Lift, you can’t actually follow people, so there isn’t a need to worry about any numbers besides how often you check-in. 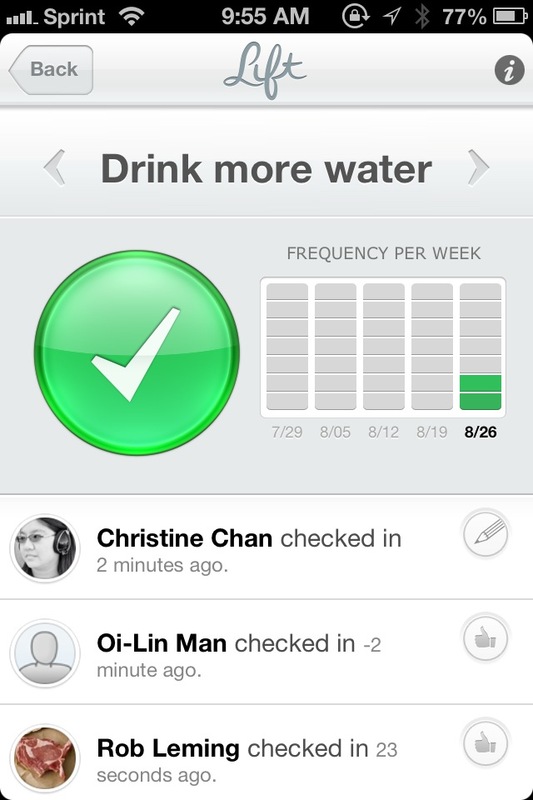 However, others are free to give you props whenever you check-in, which can be helpful in motivating you to keep going. The settings allow you to change your portrait via Twitter or Facebook, name, email address, password, and even include a bio of yourself. 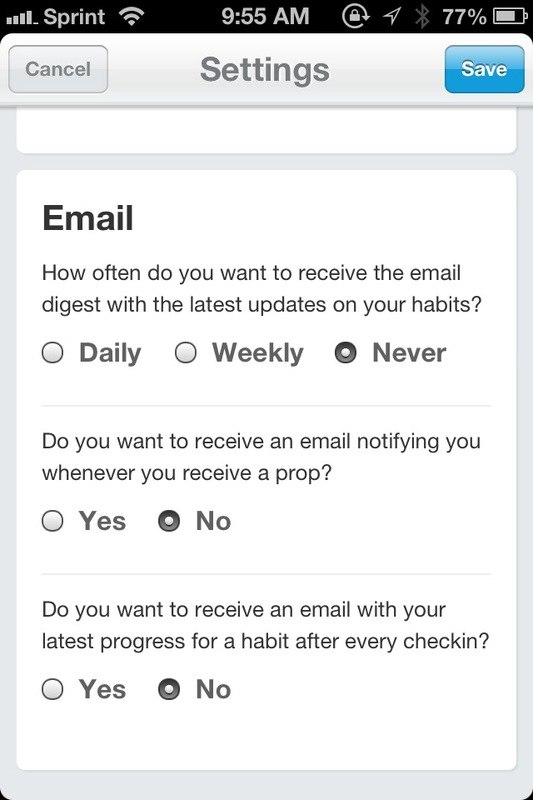 You can also change your email preferences. Lift features an incredibly clean and elegant interface that is very responsive, and it is definitely a great way to track daily patterns. 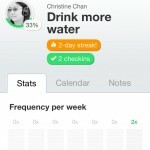 The communal element is definitely handy in helping you keep motivated, and I would recommend trying to get this app on your home screen to amplify Lift’s effectiveness. What are you waiting for? It’s time to give your potential a Lift. 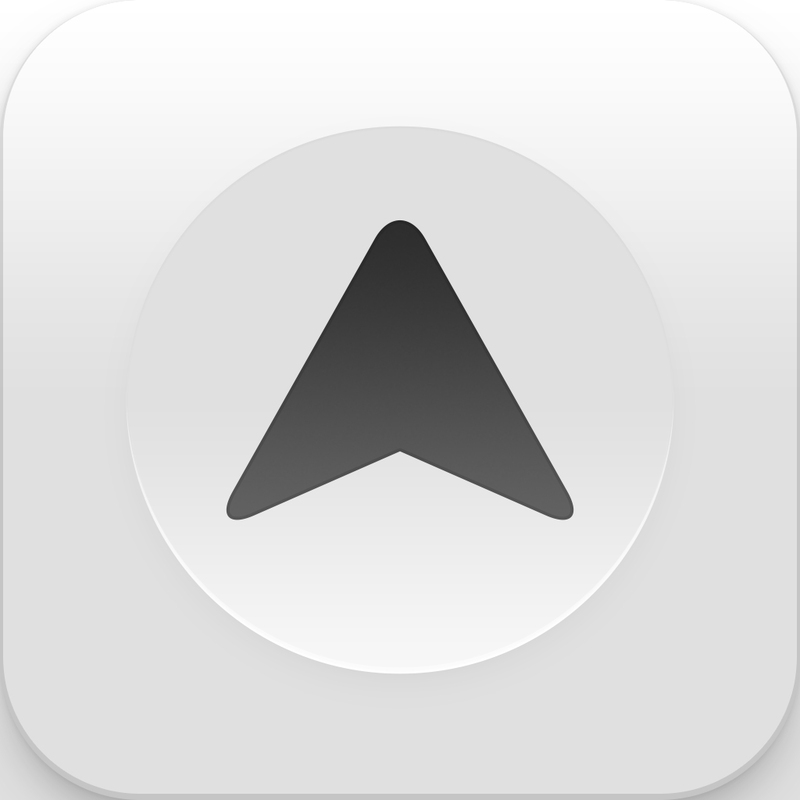 For more habit-building apps, make sure to check out this AppGuide.